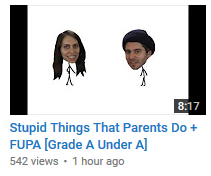 This man is taking the user GradeAUnderA's videos and reuploading them as his own. the easiest way to find a 13 yr old edge lord on the internet is the casual use of the word monday. I think grade is cool but he's such a pusillanimous individual about keemstar. He says in his videos he doesnt want to be "fake" but whenever he gets called out for not saying anything about keemstar he says "Theres nothing else to be said about him." and "Idubbbz didn't add much to the argument." And on reddit he does serious loving damage control. You can probably read up about him somewhere.